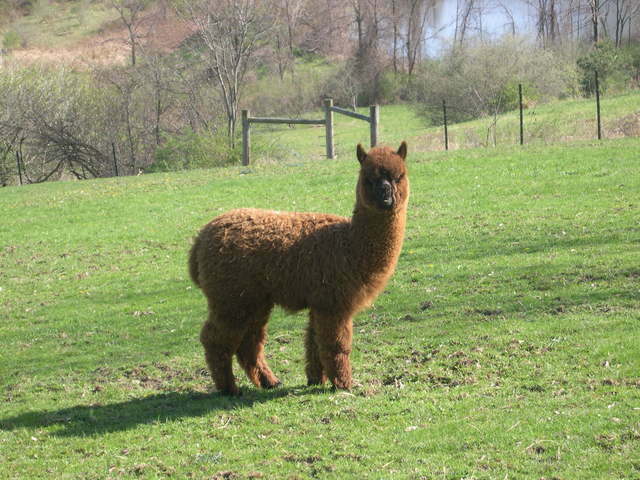 Hemlock Hills Alpaca Farm: What story is behind those names? What story is behind those names? Such a beautiful mini !!! It was another beautiful late summer morning and we were anxiously waiting for our last two pregnant girls to give birth. PC Reese (for Peanut Butter Cup Reece), the smallest female in our herd, was a soon to be first time Mom. We were keeping a very close eye on her as she seemed very, very big. I was behind the main barn and noticed a gathering of the girls which alerted me that something was going on. I walked down to see what all the commotion was about. Just as I had suspected, Reese had begun the birthing process. I went to the house to pick up the summary sheet we use to record birth information on and went to our back deck which overlooks the pasture. Through years of alpaca farming I have followed the advice that veterinarian Dr Purdy suggests. 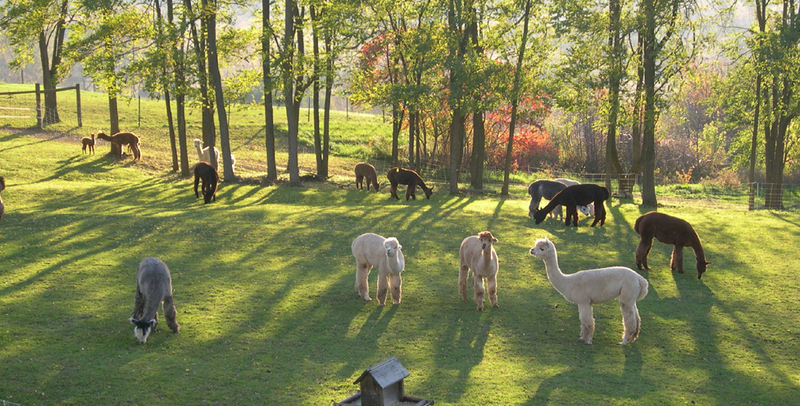 The best tools for an alpaca delivery are a chair, a rope and binoculars. His suggestion is to move a comfortable distance away, tie yourself into the chair and keep an eye on things with the binoculars. I have found this to be some of the best advice; let nature take its course. As I went to sit down and to begin my observations there was a cria already on the ground! My first thought was wow that was quick! Reece had walked about ten feet away from the cria when much to my surprise; she was giving birth to yet another. TWINS! My mind reeled…HOLY MACKERAL…TWINS! As much as I wanted to jump up and run out for a closer look I attempted to stay calm and just watch from the deck for a few minutes. The little I knew about twins was not positive, as I watched; concerning thoughts were working their way in, as I knew twins were so rare that they often don’t survive. Finally I had to take a closer look. 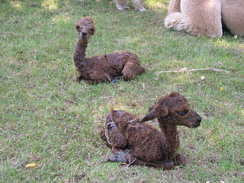 Reese did attend to both crias but she focused on the stronger cria as she followed her around. The little guy still seemed “dazed”. Over the next few days we would have to physically hold Reese and put him under mom to nurse. The first two days, we supplemented him with goat milk a couple of times but stopped as we did not want to encourage bottle feeding. The new female and Mom were getting their routine established but the tiny male was just not quite right. If the herd went one way, he went another. When we picked him up and moved him closer he would wander away again. Additionally, he tried to nurse from almost every female we had and successfully nursed off our last female to give birth even before her cria was standing. He got away with it twice! We decided perhaps there was just too much activity with the full herd of 22 females. On the third day we placed the twins and Reece (mom) together with one other gentle female as a companion animal in the barn at night. Separated from the others, we hoped they would bond if not distracted. Slowly but surely Reese seemed to be getting the idea that she was mom to two. We kept up this routine for the next five nights. During the day they were put back into the rest of the herd and out in the pastures, but nights were reserved for family bonding. It was working! The little guy began to follow his sister and Mom around and started to nurse on his own. 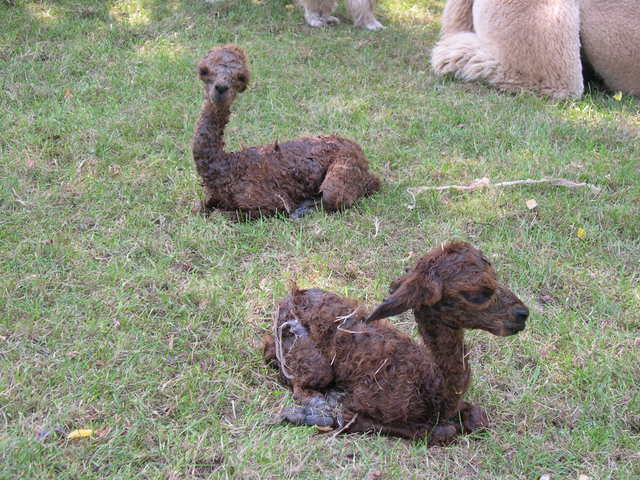 We hardly ever name our new born crias right away. Typically, the name is connected to an event, a visit, a time or a trait of the animal; something significant to each one personally. We batted around several names for almost a week but nothing quite clicked, as life was busy just attending to farm duties and the gearing up for the busy fall season. Then I remembered a historical story “Wrong Way Corrigan”. This story was about a 1938 pilot who started out for California but looped around and ended up in Ireland instead. Our new little guy was always going the wrong way as well. So Corrigan – it stuck, and was the perfect Name for him fitting the situation. The name Madigan went well with Corrigan so now we had official names for these two young ones. Time has stabilized the twins. At a year old they are still half the size of their playmates and they have become quite attached to each other. They romp and ply together with each other and every night we find them snuggling side by side. Madigan and Corrigan have that special connection of twins. All is well on the farm.